TheRustedChain - The Blog: Duct tape decorating. Again. I had lots of pretty duck tape left over from this project. And the other day when I had the rare opportunity to take a nap, inspiration struck. I had to get up immediately and get crafty. 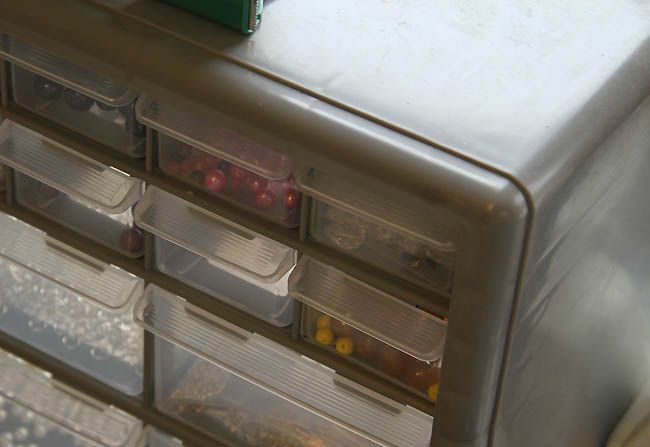 I have these ugly gray drawer things in my office, organizing beads and supplies. Why in the world do they need to stay ugly and gray?! They don't!! Pretty duct tape to the rescue. Again. I might be obsessed, y'all. Who, in their right mind, decorates with duct tape? My office has been having a makeover lately and it's getting better by the day. This is just one little thing that makes it a happy space! When I get it finished (and cleaned up... yikes), I'll show you photos. On a different note, I think we're going to look at puppies today. I'm a little nervous and teary, but we all really want a fluffy little love to fill that void. Lilo misses her friend. We just want one badly. I don't know if we'll find the right one today but we'll see. What room of your home do you spend the most time in? Most of my time is spent in the kitchen. It seems like it is NEVER clean....even though I clean it regularly. Hope you find a puppy. I'm not even kidding, I was so excited when I saw your blog title! I rubbed my hands together, giggling with my daughter, waiting for my slow computer to pull up your entry. 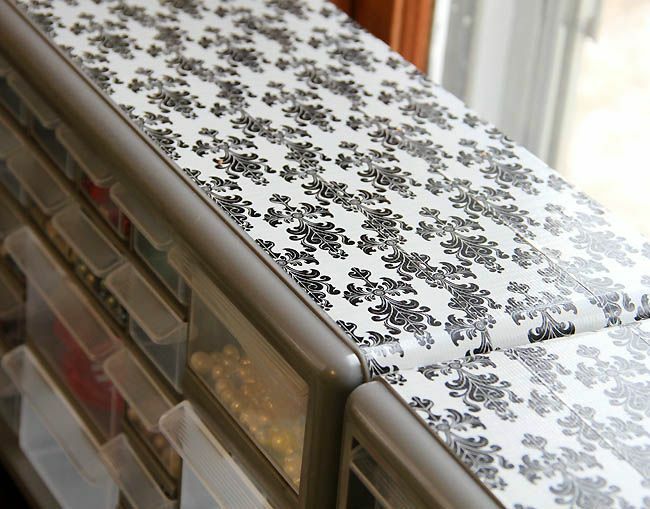 I love your new bead drawers!! We're working on creating our new craft area in the dining room today. That may be the room where I'll spend the most time after today - eating and crafting. Blessings on the puppy hunt. We have shih tzus and I absolutely love them. They're snuggly and fluffy. Great inside dogs who can adapt well to farm living :) I hope you find just what you're looking for. can't say i've ever decorated with DT, but we use it at our house. a lot. my younger son makes things like wallets and clothing....i spend the majority of my time in our living room/dining room/kitchen space. it's all one big room with a tall ceiling, exposed beams, logs....it's where we all are, except maybe the teenager who is in the basement a lot! Looking great. Can't wait to see the outcome. Hope the puppy hunt goes well. Duct tape! It's my #1 staple, I was born with a roll of it in my hands. LOL! I've not tried the new colors or designs yet. Might have to look into those! I spend most of my time in my office... since my business is in my home. Other than that, my time is spent in the kitchen. Hmmm, how come that sounds like a woman thing? LOL! Where are you finding this duct tape at chicky? I need some real bad :) I love spending time curl up on my 'fainting chair' beading and watching a movie. But you asked what room, so that would be the living room, he he! Hope you guys find a puppy today!!! I need this duct tape in my life. I spend the most time in the livingroom, since I got a new laptop and we have wireless internet. And the work I do sewing is mostly hand embroidery. P.S. I hope you find a puppy. I have the exact same drawers... and I'm totally stealing your idea. Win! The more I see what you do with duct tape the more inspired I get! I'm looking around the house trying to decide what needs a make-over! Good luck on the puppy hunt. Love the duct tape accents. We made a duct tape vest from leopard print tape back in the fall. It turned out so cute! I love duct tape, too! My daughter makes the coolest stuff out of the tie-dyed kind. Maybe I should do a post about all of her creations. Where oh where do you find duct take in a lovely damask pattern. I guess I've been living under a rock!! love how those turned out! good luck on the puppy search, even though it's still tough thinking about ellie. You and my son (he's 12) would get along beautifully! One year my brother and his family gave him an entire toolbox filled with various styles of tape and duct tape...we all cracked up so hard, it was a perfect gift for my boy! Hope you found a new little love yesterday. I've been thinking of you so often when I look at my doggie, I just cannot imagine so I hope you found another darling for your sweet home. I spend a lot of time on my main level which has my kitchen, living room and dining area. Homework is done at our kitchen island as well as crafts, eating and reading. Wow! My daughter loves the tape! :) It is pretty!